This Marksman Laserhawk 3055 Slingshot features a tapered Hyper-Velocity Band which offers 30% greater velocity than standard bands. It also has a molded finger grooved handle for added comfort when shooting for extended periods of time. Folds up for easy storge and transportability. 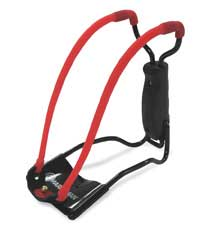 The folding wrist support makes this slingshot easy to take along with you anywhere. The wrist support doubles as a convenient ammo holder, with room for both 1/4" and 3/8" steel shot.